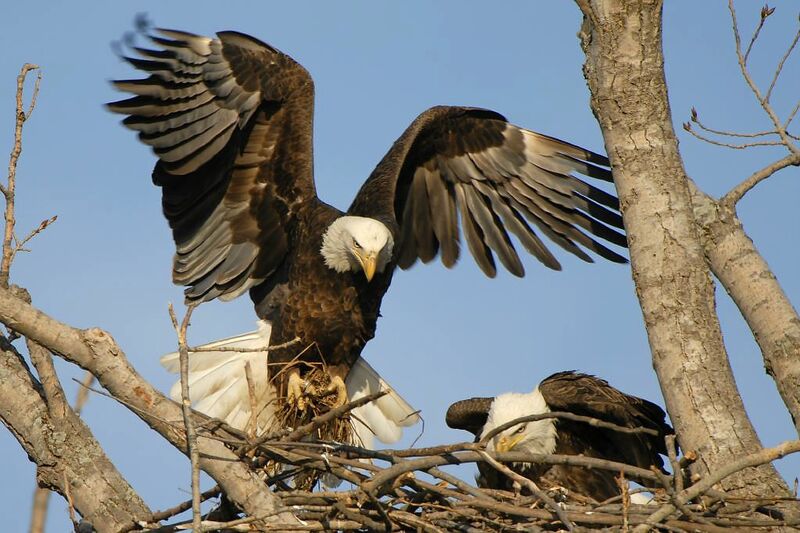 Finally, the Eagles and Allies have arrived and landed back on their Family Page. 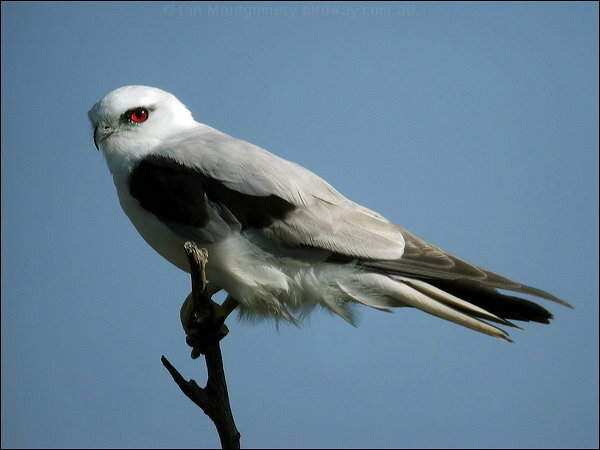 The Accipitridae – Kites, Hawks and Eagles family album has been giving me a fit. As you know from the last two post, An Apology, Plus Much Work At Hand and Rounding Up Those Eagles and Allies, I have been trying to fix 111 broken links on the page that lists the whole Accipitridae family. WordPress is a great Blogging provider, yet, there are times a blogger feels like pulling their feathers (hair) out. After searching the forums and the internet for possible answers, there doesn’t seem to be a clear answer as to how 111 photos disappeared from the Media area. Many were downloaded back in 2011 through 2016, and have been working fine. Not so sure my “faith” is being tested, but the following verses are always a comfort when I am faced with challenges. Also, maybe, I am being challenged to review and rework parts of Lee’s Birdwatching Adventures. It is coming upon 10 years old after the New Year, and often items need to be repaired and painted. Even the birds go through a renewing of their feathers. Praying for the Lord’s wisdom on this issue. What else is there to show you today, but some of the rest of the birds that returned. Thankfully, most of the Family pages do not have such enormous clans of relatives. 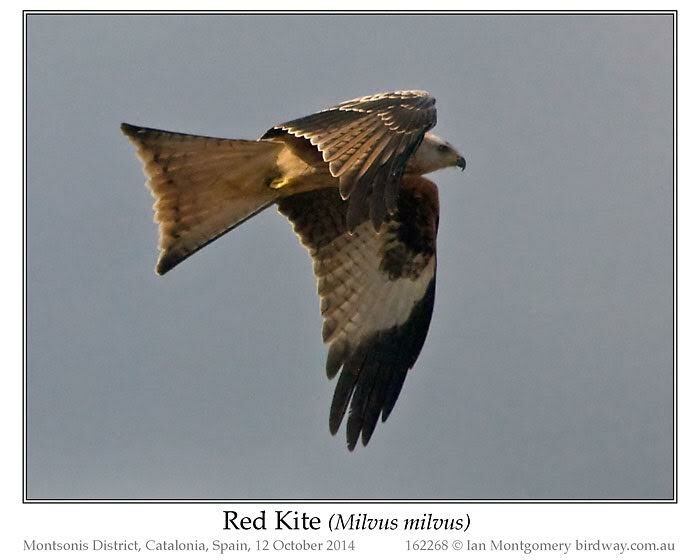 Yesterday, you were informed of 111 broken links on the Accipitridae – Kites, Hawks & Eagles page. Today there was a little bit of time to start rounding up those flying rascals. 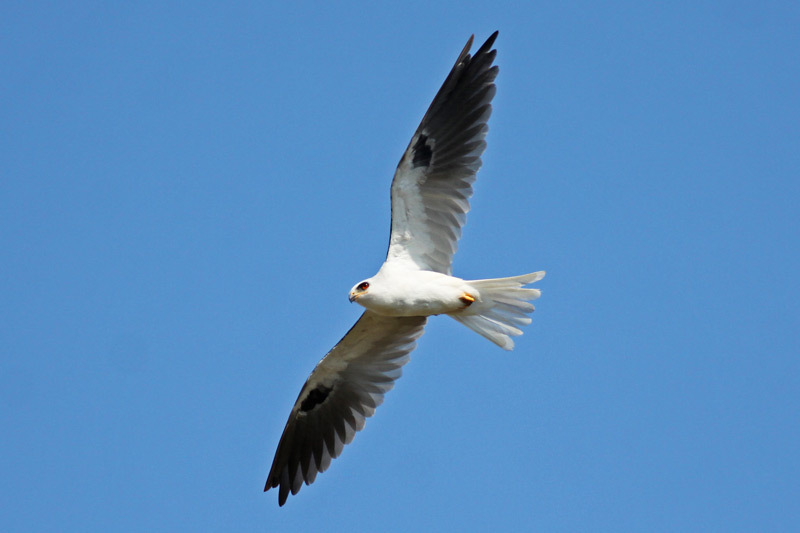 Now, there are only 60 birds still soaring around. Trust that they can be corralled soon. In Lakeland, Florida, they round up the Swans on Lake Morton this time of the year. They are in the process of doing again now. See Lake Morton Swan Roundup – 2016. That is what I feel like I am doing with these broken links. So far some of the problems have been my fault, some have been photos moved around on other sites, etc. Stay tuned, I’m on the trail of these Accipitridae beauties. Definitely bird of the month at the moment, I regret. Recently one of my cataracts worsened quickly, making it difficult to observe birds, take and edit photos: very discouraging to say the least. Thanks to the wonders of modern medicine, I had the offending lens replaced ten days ago, resulting in a spectacular improvement in my eye sight. Now I’m looking forward to getting the other one done this coming Monday. 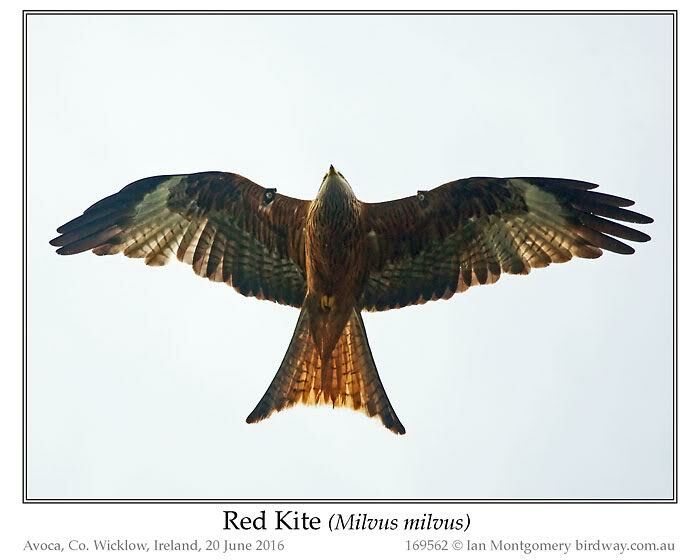 The Red Kite, like the Common Buzzard in the last edition of bird of the week, is another good news story in the recent history of raptors in Ireland. 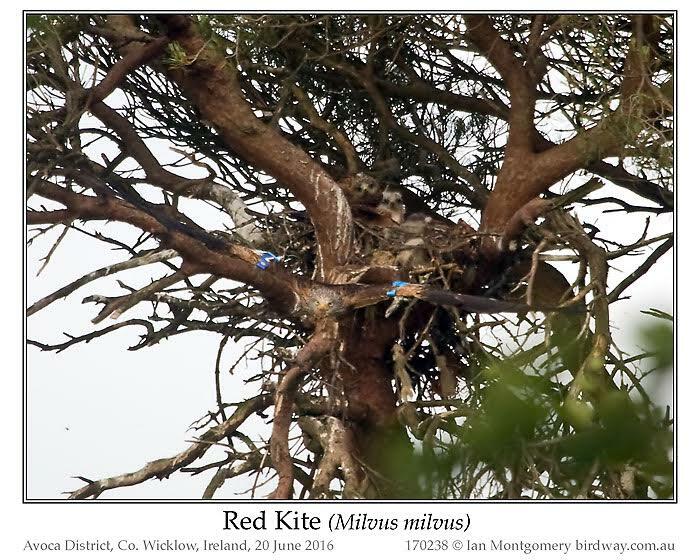 This time its recovery is a result of a successful reintroduction, rather than natural recolonisation with parallel reintroductions by the Irish Golden Eagle Trust in Co. Wicklow south of Dublin and by the RSPB in Co. Down south of Belfast, starting in 2007 and 2008 respectively. Introduced pairs nested successfully in both counties in 2010, and Irish-born Red Kites nested successfully in these counties in 2012 and 2013. 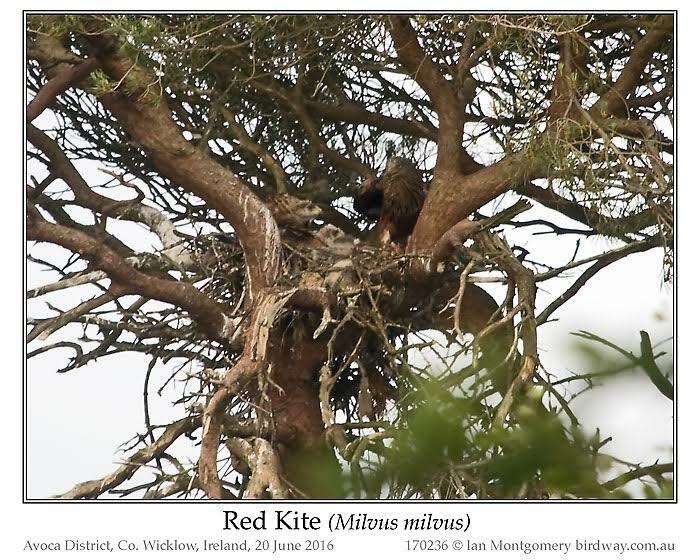 In 2014, there were 16 pairs in Co. Down and in 2015 there were 47 pairs in Co. Wicklow, 2 pairs in Co. Wexford and 4 pairs in Dublin-Meath so the population seems to be thriving despite some deaths from rodenticides – Red Kites are partial to carrion. 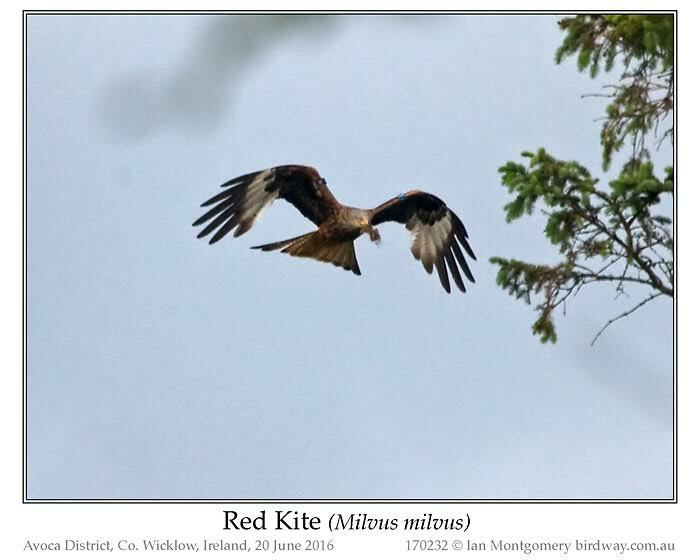 I had photographed Red Kites in Spain and Andorra in 2007 and 2014 (first photo), but I was keen to see them in Ireland too. The best place to see them in Co. Wicklow is in Avoca, where there is a winter roost which contained more than 60 birds in the 2015-2016 winter. I went there with my cousin Jean in June and after a distant view of a bird hunting along the Avoca River, she took me to another (secret) location where she had seen a pair of birds in March. Sure enough the birds were still there and nesting in a pine tree. We were of course anxious not to disturb the pair, so we parked at some distance from the nest and observed it from the car. So I make no apologies for the distance at which photos 2,3 and 4 were taken. No. 2 shows an adult bird flying towards the nest carrying food. No. 3 shows the same bird on the right of the nest being watched by two nestlings on the left. One of the nestlings looks nearly fledged while the second is less well-developed and still has downy white feathers. No. 4 shows the adult flying away from the nest still carrying the food, watched by the nestlings. The colour of the adult matches that of the tree but the blue wing tags give its location away. We wondered whether the adult was wary of us sitting in the car but it returned to the nest two minutes later and we drove away leaving them all in peace. By this time it was late evening so we drove back to Avoca village to see whether any non-breeding birds were using the roost. We parked in the car park opposite the church on the main street and were treated to several kites – and a Common Buzzard – circling over the town.. The one in the last photo flew right over our heads in the car park. You can see the wing tags on this one too. Congratulations to both the Golden Eagle Trust and the RSPB on their wonderful work. I had begun to wonder where Ian had disappeared to. Concerned he may have been sick or hurt. Now we know. Thanks, Ian, for telling us about your cataract problem. Been there, done that. What a difference it makes when they put the lens implant in. Like you, I need one more, but mine isn’t “ripe” yet, as they tell me. What a beautiful Kite. That last photo is my favorite! I sent the previous post by mistake when I was working on the ebook version of the birds of the week this afternoon. 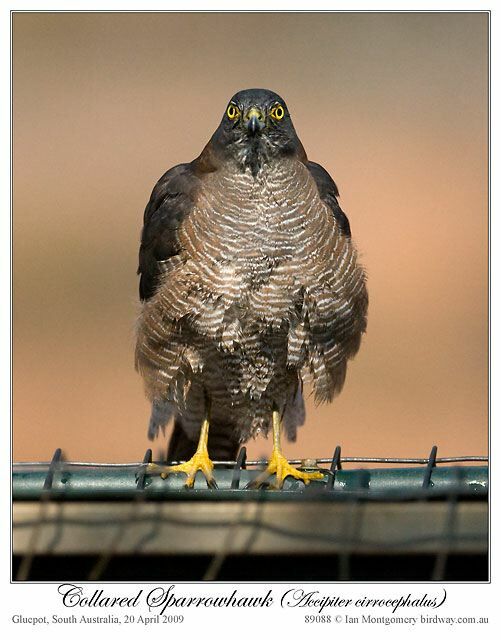 This was actually bird of the week in May 2009, and then I thought it was a Brown Goshawk until a raptor expert recently pointed out the error of my ways with these photos on the website. I’m making good progress with the ebook. It’s getting quite large, so I’m going to publish it two volumes. The first will be 2002 to 2009. I’ll keep you posted on progress. I think I’m going to call it ‘Diary of a Bird Photographer‘ as it reads like a (weekly) diary. Anyway, here is the full, corrected posting, six years late! 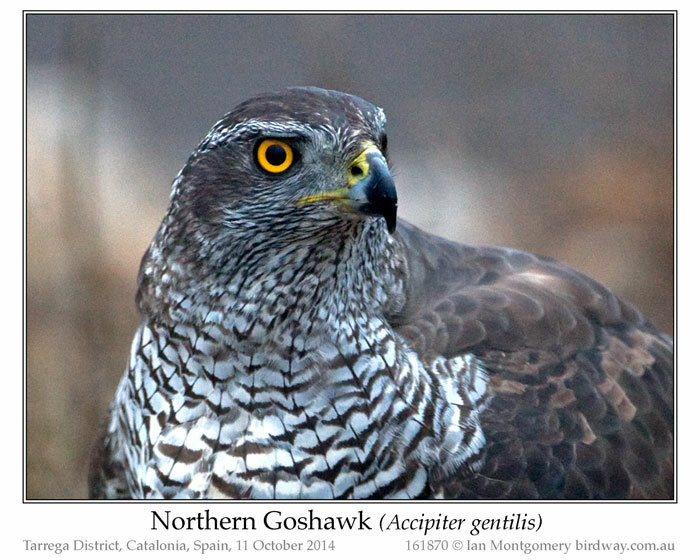 *Note: this was originally posted as a Brown Goshawk, but the bird is actually a Collared Sparrowhawk. Please accept my apologies. I’m still sorting through the photos that I took at Gluepot last month. One surprising visitor to the watering point near the hide was a Collared Sparrowhawk that came in to drink and bathe. She (it was rather large) spent nearly half an hour at the tank and bathed several times. Naturally, all the other traffic at the watering point came to a standstill, though I was amused to see a flock of Brown Honeyeaters becoming increasingly restless and approaching much closer than I would have expected. Eventually, she vanished as swiftly as she had appeared and things returned to normal. The Sparrowhawk seemed very wary, particularly when preparing to bathe and looked around repeatedly as if making sure the coast was clear. It was almost as if the Queen of the Forest couldn’t be seen to be doing her toilet in public and she certainly looked very undignified both when bathing, second photo, and when she emerged wet and bedraggled from the water, third photo. I was impressed by how soft and owl-like the feathers were – the original stealth attack aircraft, I suppose. 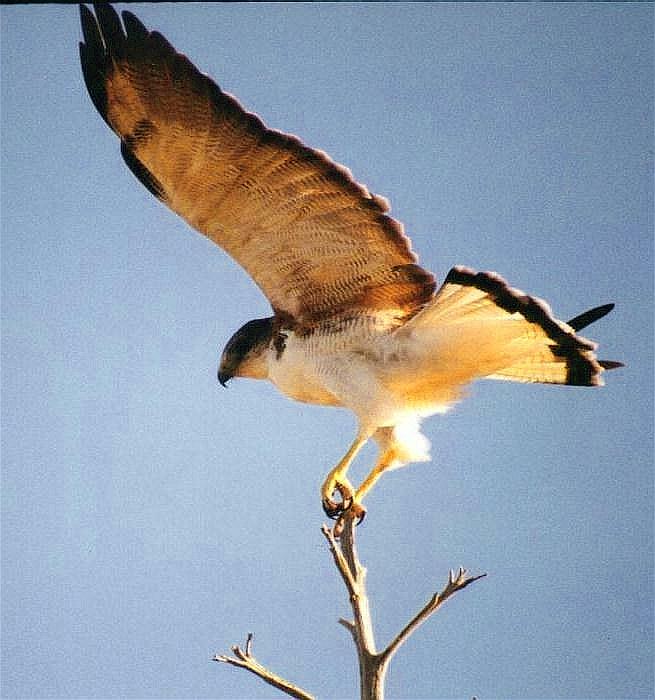 Collared Sparrowhawks are smallish hawks,30-40cm/12-16in long, with a wingspan to 70cm/28in. As with many birds of prey, the females are larger and this is thought to be to protect the nestlings from the males in a weak moment. 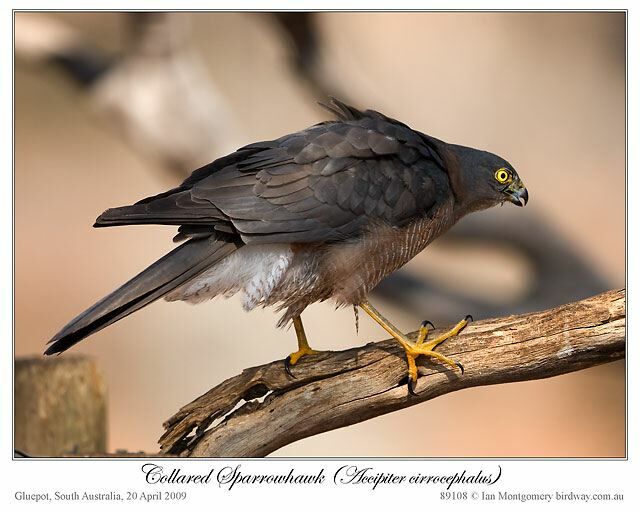 The Collared Sparrowhawk is widespread in all except the driest areas of Australia and New Guinea and because of its furtive behaviour and confusion with the similar Brown Goshawk, is probably commoner than might be supposed. Recent updates* to the website include new galleries for the Australo-PapuanTreecreepers (), additional photos of various Honeyeaters, Wedge-tailed Eagle and White-bellied Sea-Eagle. *recent in 2009, but the links are still valid. Another neat bird he has introduced us to, even though it is apparently six years late. Ian gave his permission and I started doing his newsletter in July of 2009. That Brown Goshawk (was dated in May 2009, so it was never written up) I did go back and catch some of his older newsletters as you can see from the list. Wow! Has it been 6 years? Ian, thank you for that permission. With his newsletter and photograph usage, Ian has been a large input for this blog. 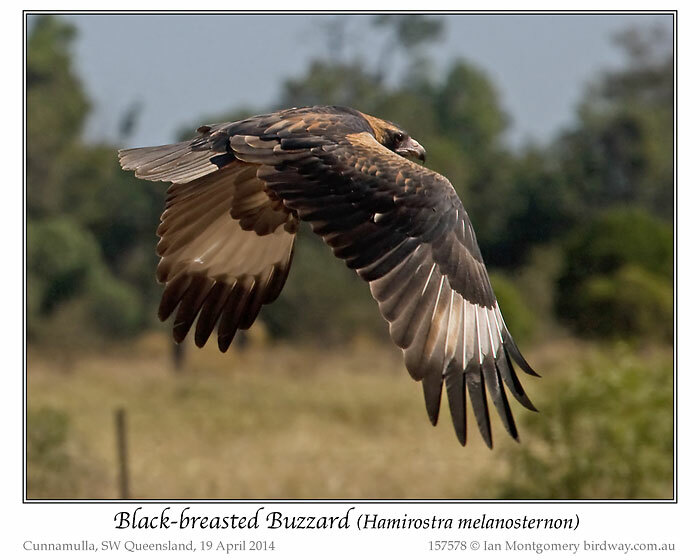 Ian’s Honeyeaters, Wedge-tailed Eagle and White-bellied Sea-Eagle. I got so absorbed in recounting my experiences in Catalonia, that I forgot to mention that I’ve been home in North Queensland for several weeks. The piece about the effects of diclofenac prompted some interesting responses. It was pointed out that it causes kidney not liver failure in vultures, my apologies, and that a safe and effective substitute in both humans and livestock is the anti-inflammatory meloxicam. It’s sold here as Mobic, which I take sometimes when I wayward spinal disc misbehaves. I also received a link to this article by the Vulture Conservation Foundation which has managed to get the EU to do an investigation into the effects of diclofenac: http://www.4vultures.org/our-work/campaigning-to-ban-diclofenac-in-europe/. 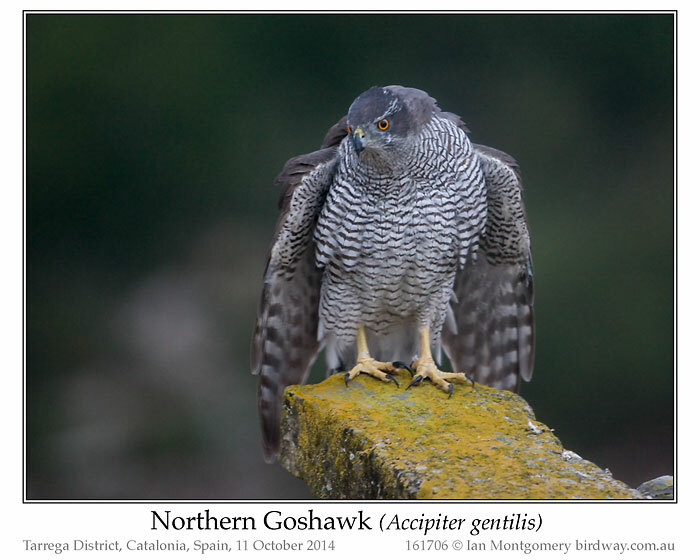 On the second day of our stay in raptor country in the Pyrenees with Birding in Spain we – my sister Gillian joined me for this one – were taken by Steve West to a hide at a Northern Goshawk feeding station before sunrise – goshawks are earlier risers than I am normally and are shy. Here the goshawks are fed regularly on chicken carcasses and fresh pigeon, the product of a culling programme by the local council. It was a misty, chilly, gloomy morning – sunrise was the time of day rather than an event – and the first bird to arrive, the adult female in photos 1 and 2, was barely visible. The second photo was taken at 1/3 of a second exposure at 1600 ISO and my tripod, inconvenient for travel, proved its worth yet again. Adult females are more strongly barred and much larger than males (to protect succulent-looking nestlings). This one is partially spreading its wings and tail near the food in a posture that looks like a rudimentary ‘mantling’ display. 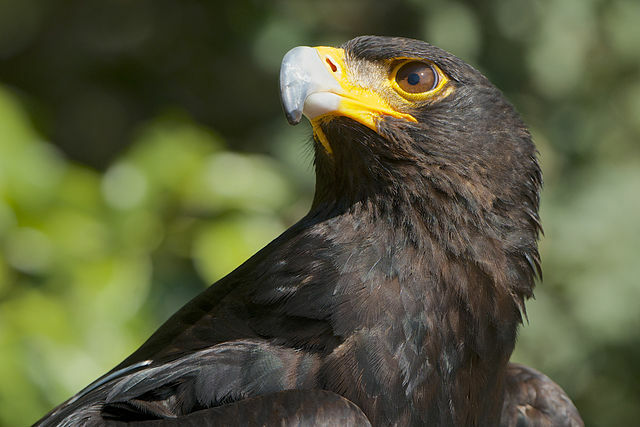 This is usually used by hawks as a threat display to discourage other ones from interfering with their prey. In this case, I suspect it was signalling the presence of food to the juvenile goshawk, third photo, who appeared shortly afterwards. First year juvenile Northern Goshawks are brown with buff, almost cinnamon underparts and are streaked rather than barred. 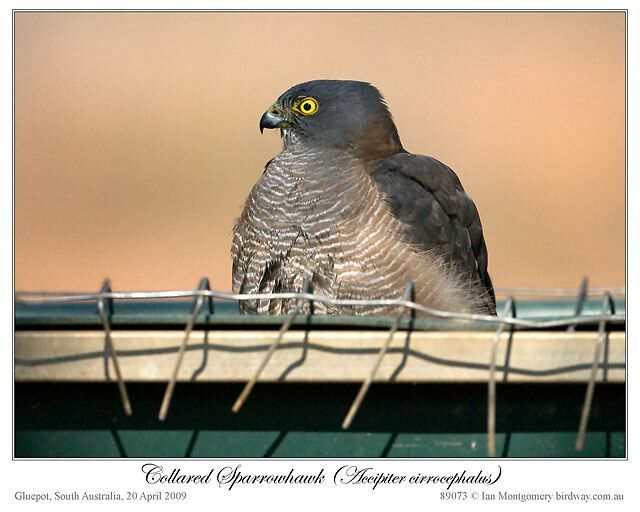 Similar juvenile plumages occur in other close relatives in the Accipiter genus such as the Brown Goshawk (A. fasciatus) and Collared Sparrowhawk (A. cirrocephalus), both common in Australia; see http://www.birdway.com.au/accipitridae/brown_goshawk/source/brown_goshawk_32464.htm and http://www.birdway.com.au/accipitridae/collared_sparrowhawk/source/collared_sparrowhawk_62859.htm for examples of their juvenile plumage. Note, incidentally the ‘beetle-brow’ characteristic also of the Brown Goshawk that gives the larger goshawks their fierce expression. 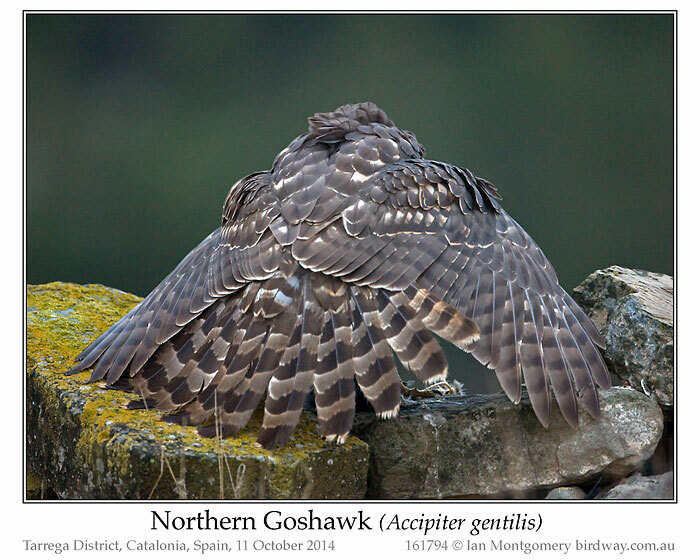 The adult female moved aside and let the juvenile have the pigeon prey and the juvenile then adopted the possessive mantling display with spread wings and tail and fluffed-out feathers of the mantle, just below the neck. Mother, I presume, tackled a piece of chicken carcass and carried it down onto the ground closer to the hide, but partially obscured by dried grass and other vegetation. 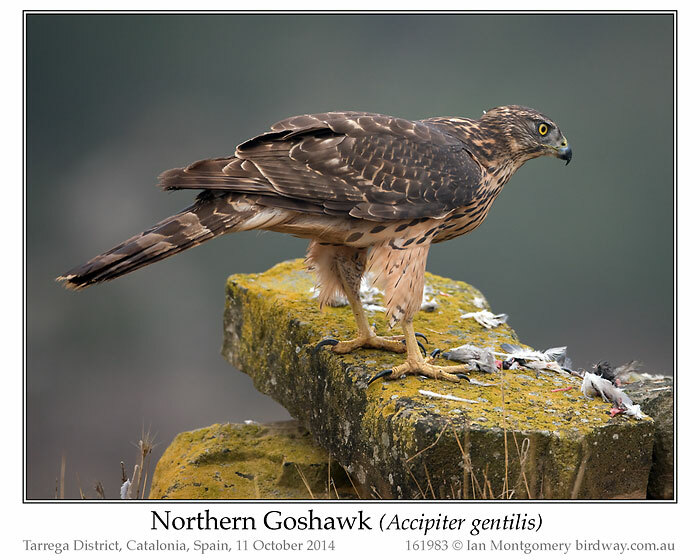 The sixth photo shows the juvenile somewhat later with the remains of the pigeon. This was a very large bird too, as you can perhaps judge from its appearance, so I concluded that it was female too. 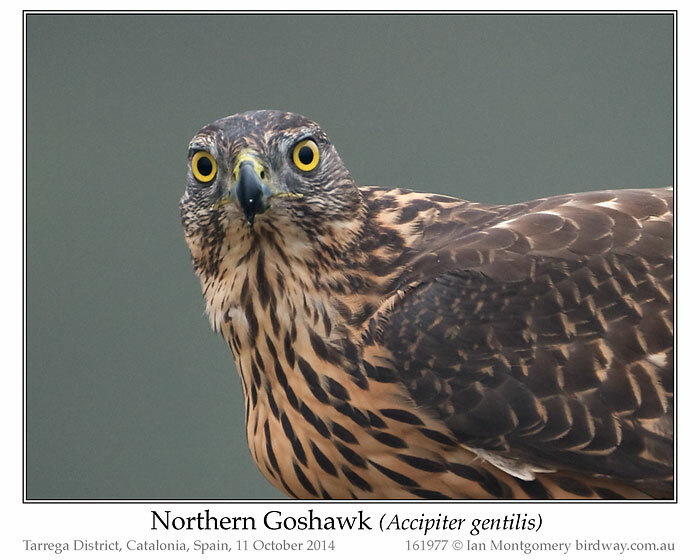 ‘Huge’ is perhaps a better description, as the Northern Goshawk is easily the world’s largest of the nearly 50 or so species of Accipiter – (typical hawks comprising larger goshawks and smaller sparrowhawks, though ‘hawk’ is also used in North America to name other raptors such as those in the genus Buteo aka ‘Buzzard’ in British English). 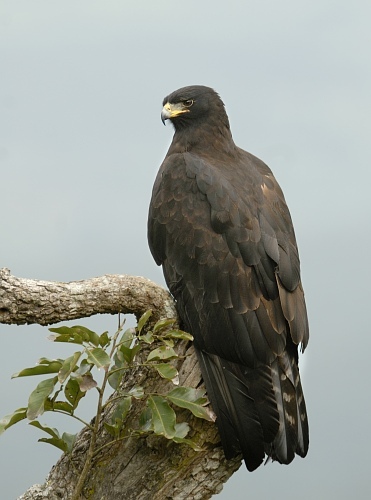 The female is up to 65cm/26in in length with a wingspan of up to 120cm/47in and a weight of up to 2.0kg/4.5lb, comparable in size with many Buzzards. 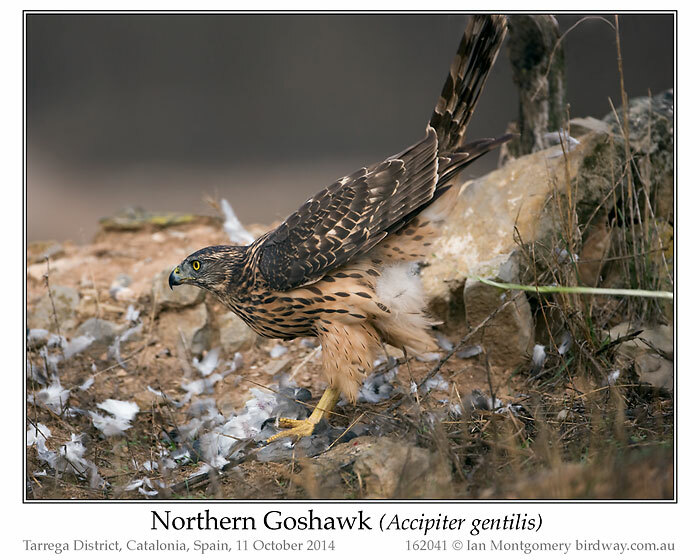 All the Accipiter hawks tackle relatively large prey, mainly birds and some mammals. They hunt by surprise and pursuit and have rounded wings, long tails and fast reflexes for great manoeuvrability in forests. I suspect that Linnaeus used the specific moniker ‘gentilis’ in the sense of ‘noble’ rather than ‘gentle’. 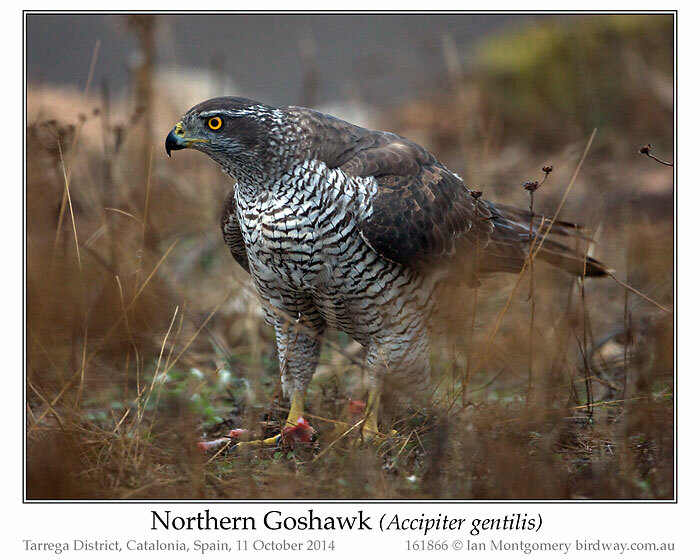 ‘Goshawk’ comes from the Old English ‘göshafoc’ meaning goose hawk, no mere chicken hawk. This was another species that had aroused my interest in my field guide as an Irish teenager, and hadn’t seen before this trip. It’s a very rare vagrant in Ireland and was then only an occasional breeder in Britain though widespread if uncommon elsewhere in temperate regions of the Northern Hemisphere. Since then it has become re-established in Britain with a breeding population of 300-400 pairs. Both birds lightened their load, as many raptors do, before taking flight, as the juvenile is doing in the seventh photo. There’s a photo on the website of the female doing the same thing: http://www.birdway.com.au/accipitridae/northern_goshawk/source/northern_goshawk_161882.htm. Even nobles have to perform basic functions: don’t stand behind or below a well-fed raptor :-). What a beautiful family of birds. Ian always has such great photos and adventures to share with us. Thanks, Ian. This is 2 of 3 in a series on Eurasian vultures photographed during my recent spell in a bird hide at a vulture feeding station in Boumort National Reserve in the Pyrenees in Catalonia not far southwest of Andorra. The first of the series was on the Griffon Vulture (see http://www.birdway.com.au/accipitridae/griffon_vulture/index.htm where I’ve put a dozen photos), this one is on the second species in the feeding order, the Cinereous or Eurasian Black Vulture. Here, incidentally, is the view taken from the hide – with my phone! – shortly after the rangers had left and the first one hundred or so Griffons, and a few Common Ravens, were in the process of arriving. Because of the wide-angled nature of phone cameras, the vultures appeared in real-life to be much closer, close enough for one bird to almost fill the frame of a full-size (35mm sensor) DSLR with a 500mm lens. 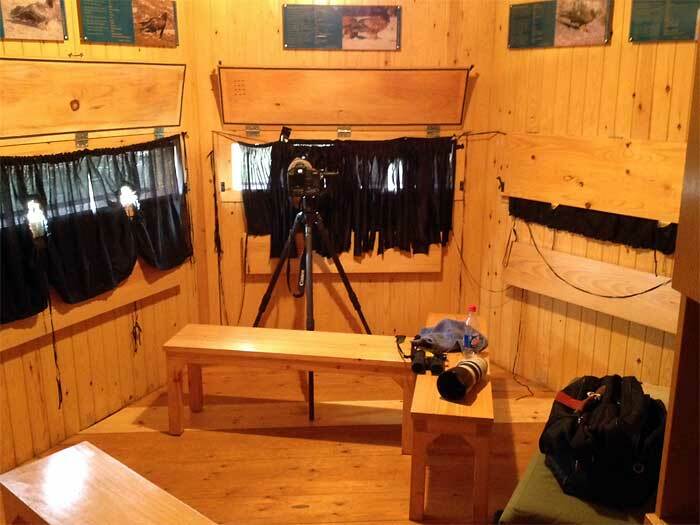 The second photo shows the luxurious and well-appointed hide (I mentioned the toilet last week) with my camera and 500mm lens set up on my tripod and my binoculars and smaller 100-400mm lens at the ready. I was on my own for the whole day, so I could move freely between the three viewing openings. The one in the middle overlooked the feeding site (above), the one on the left was good for photographing landing vultures using the 100-400mm lens, while the one on the right overlooked a pond, used by the vultures on a hot day. It was cool and overcast when I was there and rained a bit, so the only vulture I saw at the pond was a Griffon having a drink. It’s impossible to travel lightly with good gear for wildlife photography – the tripod along required taking a larger suitcase than both I and airlines prefer – but on that day in the hide and on an earlier occasion when I was photographing Crab Plovers in Dubai, I was really glad to have to have brought the necessary stuff with me. Anyway, back to the Cinereous Vulture. 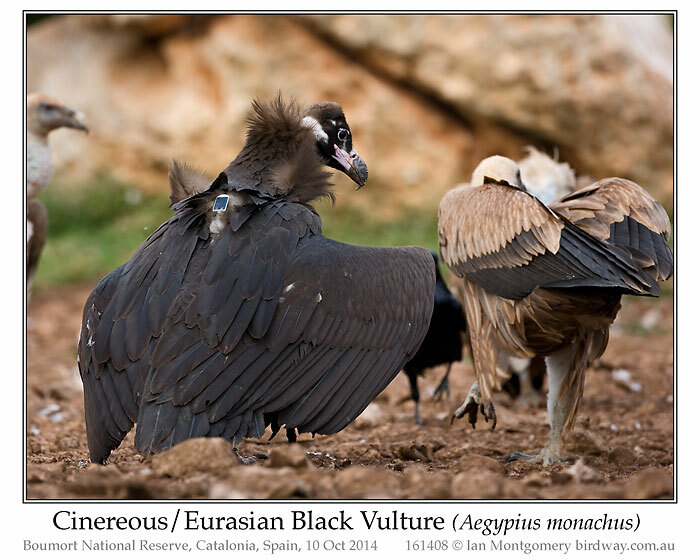 In the days when birders weren’t inter-continental travellers, it was called the Black Vulture until it was realised that this risked confusion with the completely unrelated Black Vulture of Central and South America and the ‘Eurasian’ label was applied. 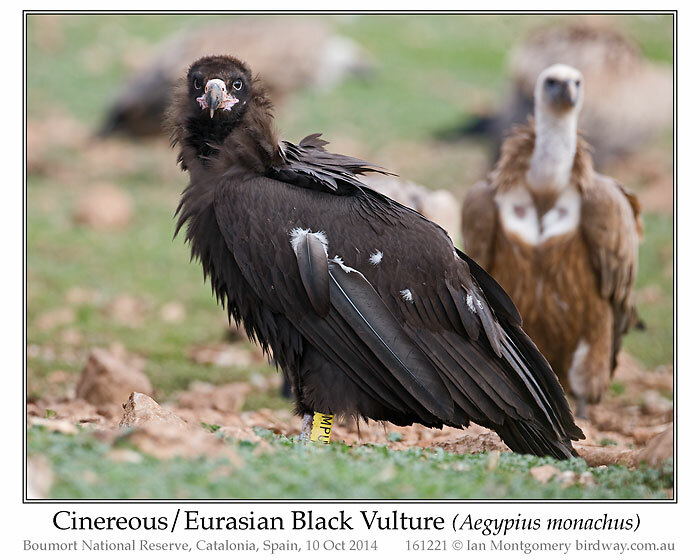 Now BirdLIfe International call it the Cinereous Vulture, ‘cinereous’ meaning ‘ashy’, like the adult in the third photo, which certainly looks as it has been rummaging around in the remains of a camp fire. This bird shows the typical vulture ruff, with the cowl-like adornment characteristic of this species. The specific name monachus means ‘hooded’ but the common name Hooded Vulture is already used for another somewhat similar, sub-Saharan species, Necrosyrtes monachus. Juvenile birds are much darker, dark chocolate really, like the slightly scruffy one in the fourth photo. Some field guides say that juvenile birds have pink facial skin – like this one – but I couldn’t find a clear correlation between age and skin colour: some adults had mainly blue, others more pink skin, which made me wonder whether it was influenced by gender. All the Cinereous Vultures here had metallic identifying rings/bands and some, particularly juveniles had coloured bands as well. This is because the species has recently been re-introduced to this area from central Spain, is now breeding and the population is being studied thoroughly. The Cinereous Vultures took their time and started arrived at the feeding site about an hour after the Griffons. As you can guess from the relative amounts of plumage on the heads and necks of the two species, they have quite different feeding habits. Griffons clearly don’t mind getting up to their elbows in it, so to speak, but the Cinereous Vultures prefer to wait until the dirty work has been done and then pick up their favourite morsels. Their reluctance to get involved in the initial scrum has nothing to do with size or dominance, the Cinereous Vultures are as large or larger than the Griffons and are quite dominant. The bird in the fifth photo has a feeding juvenile Griffon it its sights and is advancing threateningly in a manner that was wonderful to watch, head down, wings spread and ruff and cowl feathers erect with a bouncing walk. The result was something like the witches from Macbeth combined with the loping gait of a kangaroo. 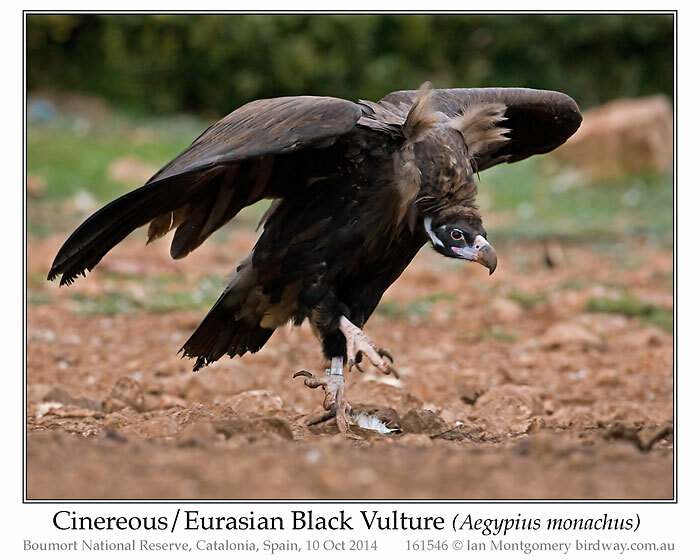 The Cinereous Vultures were the least volatile of the three species and once having landed, hung around for hours. I didn’t get photos of any in flight, but I didn’t find them easy to separate from the Griffons in flight as they’re silhouettes are rather similar. The Griffons kept landing and talking off and were better targets and more numerous. 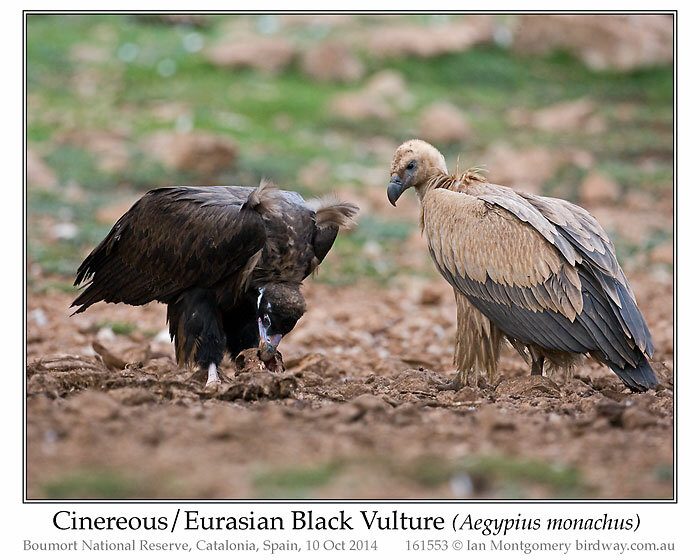 In total, there may have been 10-20 Cinereous Vultures. Their reintroduction here is part of a more general EU conservation and anti-poisoning program that has seen the population in Spain recover from 290 pairs in 1984 to perhaps 2500 now and they have been reintroduced into southern France. The conservation news isn’t all good, though to say the least, and I’ll return to this topic in the third in this series. 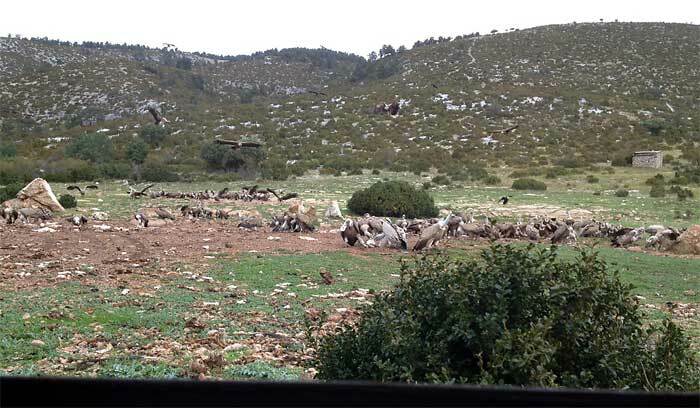 Part of the research effort at Boumort is the study of the movements of these vultures. Adults are thought to be mainly sedentary in Europe, though partially migratory in Asia, where it also occurs. Some banded Spanish birds have turned up in sub-Saharan Africa. Some birds have been fitted with GPS units, and you can see one, complete with solar cell on the back of the juvenile in the last photo. I mentioned the unrelated Black Vulture of the Americas, one of the New World Vultures. These include the Turkey Vulture, familiar in North America, the Condors and a couple of other species places in a separate family, the Cathartidae http://www.birdway.com.au/cathartidae/index.htm. In fact Birdlife International put them in their own order, the Cathartiformes, indicating that they arose completely independently. The Old World Vultures, on the other hand, are close related to hawks, eagles, etc. and are placed in the same family Acciptridae in the order Acciptriformes. 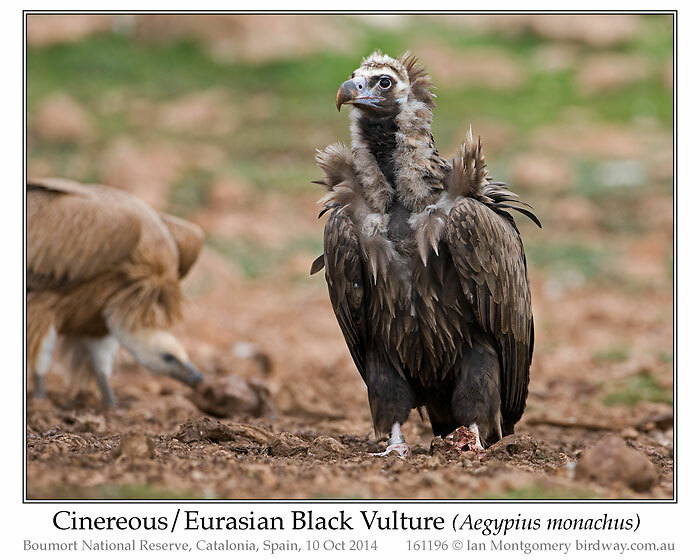 I must admit I was struck by the eagle-like facial appearance of these birds and it appears that the Old World Vultures have developed twice within the Acciptridae. Most belong to a group of typical Old World vultures that includes the Griffon and the Cinereous. Three, however, form a separate group placed taxonomically near the Serpent Eagles. One of these is the subject of the next edition. 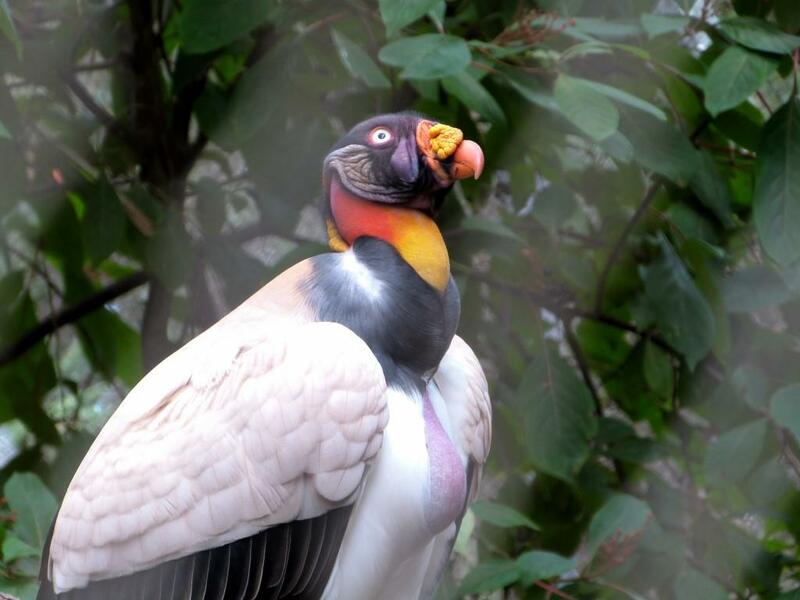 The vultures kept me waiting in suspense for crowning moment, and I’m trying to make you share the anticipation: I have something really special for the next bird of the week! What a blind! When Ian go out photographing, he goes all the way. I always enjoy his adventures. Vultures are a favorite of mine, but the Lord created them and gave them a job to do. What would the world look like if they didn’t come down and clear up carcasses. Again, these Vultures are members of the Accipitridae – Kites, Hawks and Eagles Family. I like that fifth photo with that pose of his. Especially with Halloween just around the corner.